Game includes soft bat and lightweight balls. Swing away as the ball floats on a column of air. Aim for several targets on the baseball diamond. Balls roll back to the red cone after each hit. Great for team practice, team fund raisers, baseball field activities or parties. Hitting the ball is harder than it looks! 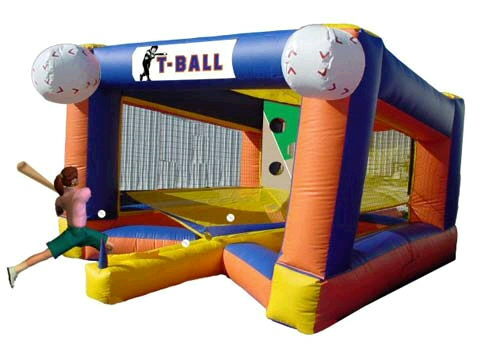 * Please call us for any questions on our inflatable t ball game rentals in Pipersville PA, Hatfield PA, and Bucks & Montgomery Counties in Pennsylvania.